You’ve probably seen caterpillars in your garden and enjoyed watching butterflies flitting around your yard. But have you ever seen the process of how a caterpillar becomes a butterfly, from beginning to end? 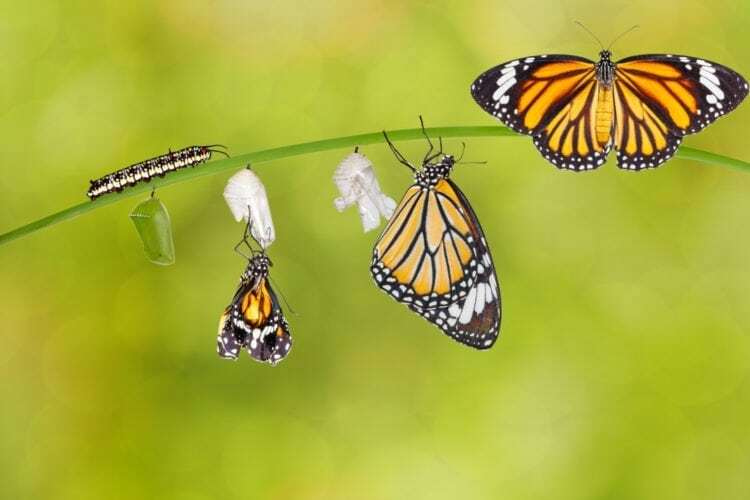 Take a look at this video that captures the amazing metamorphosis of a caterpillar as it goes through its life cycle. Once the baby caterpillar (also called larvae) hatches from his egg, he eats the egg. Then, he keeps on eating and eating leaves until he has grown to 100 times the size he was when he hatched. The third stage is the most fascinating — and perhaps the most disgusting. The caterpillar wiggles and pushes his body until he splits his skin open. This is how the pupa is formed. The outer skin hardens and appears dormant for weeks or even months, but there is a lot going on inside. The caterpillar literally digests his old self and develops into his beautiful final form: the butterfly. There are several plants you can add to your garden that will attract butterflies, so you can witness the fascinating stages of their transformation in real life and enjoy their graceful beauty. And the next time your kids ask you how a caterpillar becomes a butterfly, you can show them this mind-blowing video!